A huge, multibillion-dollar company closely tied to the Chinese army has set up operations in ports all around the world. From Panama to the Philippines, an arm of Hutchison-Whampoa, Hutchison Port Holding (HPH), has become the world’s largest seaport operator, embedding itself in strategic seaports all across the globe. Hutchison holds the exclusive contract to operate the Panama Canal. An animated map on the Hutchison-Whampoa Web site shows the extent of the encircling movement with seaport operations in Africa (Tanzania International Terminal Services Ltd.) in the Western Hemisphere with seaport services in Beunos Aires, Argentina; Freeport, the Bahamas; Veracruz, Mexico; and at both ends of the Panama Canal. HPH’s latest acquisition, announced last month, involved eight Philippine ports. New ports in Mexico, Argentina, Saudi Arabia, Pakistan, Tanzania and Thailand make Hutchision-Whampoa the world’s largest private port operator with 23 cargo berths, bringing its worldwide total of ports to a staggering 136. Other ports include Jakarta, Indonesia; Karachi, Pakistan; India (where the company runs the cellular phone services); Burma; China; and Malaysia. There are port operations in Britain at Harwich, Felixstowe (Britain’s largest port), and Thamesport, and in the Netherlands at Rotterdam. The last acquisition has caused alarm at the European Commission." That all just sounds like hugely successful capitalist enterprise, but what are these alleged ties to the People's Liberation Army? According to a 1999 investigative report by the American Foreign Policy Council, "Hutchison Whampoa, through its Hutchison International Terminals [HIT] subsidiary or Panama Ports Company, has substantial links to the Chinese communist government and the People's Liberation Army." The company is headed by a Li Ka-Shing, the chairman of Hutchison Whampoa Ltd. Intelligence sources say he has deep connections with the Chinese Communist government. "Li has invested more than a billion dollars in China and owns most of the dock space in Hong Kong. In an exclusive deal with the People's Republic of China's communist government, Li has the right of first refusal over all PRC ports south of the Yangtze river, which involves a close working relationship with the Chinese military and businesses controlled by the People's Liberation Army,” the AFP report stated. COSCO, which failed in a President Clinton-backed attempt to lease the former U.S. Naval base in Long Beach, California, has been criticized for shipping Chinese missiles, missile components, jet fighters and other weapons technologies to nations such as Libya, Iraq, Iran and Pakistan, the AFP report revealed. Li is also a board member of CITIC. U.S. intelligence sources have described the company as a front for China's governmental State Council. Rep. Dana Rohrabacher, R-Calif., has stated that CITIC has been used as a front company by China's military to acquire technology for weapons development. A report by NewsMax.com.’s Christopher Ruddy and Stephan Archer noted that a declassified report by the U.S. Southern Command's Joint Intelligence Center, prepared in October 1999 and obtained by the government watchdog Judicial Watch, said that "Hutchison Whampoa's owner, Hong Kong tycoon Li Ka-Shing, has extensive business ties in Beijing and has compelling financial reasons to maintain a good relationship with China's leadership." The military intelligence report also warns that "Hutchison containerized shipping facilities in the Panama Canal, as well as the Bahamas, could provide a conduit for illegal shipments of technology or prohibited items from the West to the PRC, or facilitate the movement of arms and other prohibited items into the Americas." A June 1997 Rand report, "Chinese Military Commerce and U.S. National Security," stated, "Hutchison Whampoa of Hong Kong, controlled by Hong Kong billionaire Li Ka-shing, is also negotiating for PLA wireless system contracts, which would build upon his equity interest in Poly-owned Yangpu Land Development Company, which is building infrastructure on China's Hainan Island." 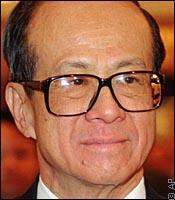 In 1998, Li Ka-shing attempted to issue $2 billion in bonds, through his Hutchison company, in the United States. According to the Dow Jones Newswire, Hutchison revealed that 50 percent of the bonds would be used through a subsidiary known as Chung Kiu Communications Ltd., which had signed agreements to provide cellular services and equipment to joint ventures between the People's Liberation Army and the Chinese Ministry of Posts and Telecommunications. Frank Gaffney, of the Center for Security Policy, has written that Whampoa "is currently hard at work acquiring a presence for China at other strategic 'choke points' around the world, including notably the Caribbean's Bahamas, the Mediterranean's Malta, and the Persian Gulf's Straits of Hormuz. At a moment inconvenient to the United States, such access could translate into physical or other obstacles to our use of such waterways." I wonder if the Christchurch City Council is aware of the potential strategic and political implications of giving Hutchison-Whampoa and indirectly, the People's Liberation Army, a foothold in this country? Is this a tiger we really want to ride? Intelligence sources say he has deep connections with the Chinese Communist government. Every successful business in China has to have connections with the Chinese government. The more successful, the deeper the connection. We knew this already. Free trade means leaving Kiwis be to transact with whoever they please, communist dictatorships or whatever. This is subject to defense concerns. It should be subject to the Kiwis in question doing it with their own money, which CCC is not- but that's that. I say let Garry More dance with the tiger, let's keep an eye on the tiger and take his money. If and when a link is proven which places Hutchison Whampoa as an enemy of of New Zealand...boot their yellow asses out and keep all their money.